As smartphones have progressed they seem to have become more and more fragile, with the highly advanced iPhone X being dubbed "the most breakable phone ever". But not everyone wants a device that will break every time it is dropped, and for ten years Samsung have been catering to that market. 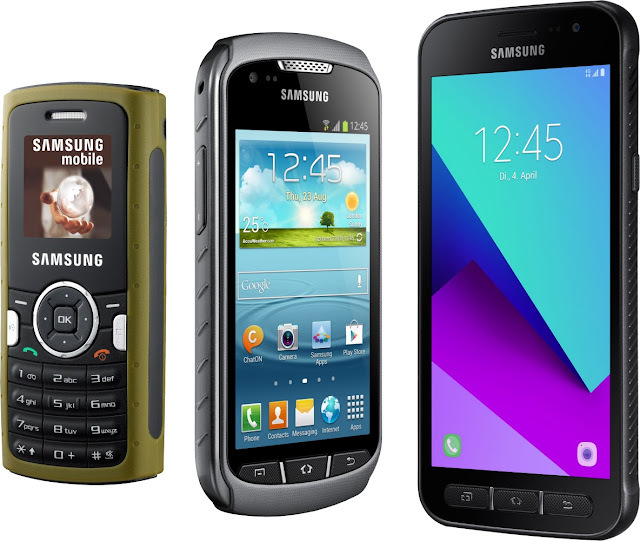 Although they're not the only maker of rugged smartphones, Samsung have been in that business longer than most with a variety of devices that you can actually use, starting with the Samsung M110 ten years ago. People were still happy with 2G feature phones back in 2008, and the Samsung M110 (also known as the Samsung Solid) was just that. A 128 x 128 pixel 1.5" display with a VGA resolution camera with a flash that doubled as a torch, an FM radio and Bluetooth, the M110 had just enough technical features to be useful. And as with most phones of that generation, you could talk for hours on it and the battery would last for days. However, the IP54 rated toughened body meant that it was splash-proof and resistant to being dropped, and the chunky black or olive green casing was rather nice to look at. Weighing just 90 grams, it was a lot lighter than the rival Sonim XP1. The M110 was successful enough for Samsung to follow it up with several other products, evolving over time. Five years and several handsets later, this led to the.. The Xcover 2 was Samsung's second toughened Android smartphone, and the thick rubber casing shares many features with the M110 from almost exactly half a decade earlier. Rated IP67, the Xcover 2 was fully waterproof and dust-proof but this time the 4" WVGA display and 5 megapixel primary camera, 3.5G support, WiFi, GPS and all the usual Android smartphone features meant that this could be used in the real world plus it retained the FM radio. It wasn't the world's most advanced smartphone, with features near the bottom of the Samsung range, and all the toughening made it quite big and heavy. But very few smartphones at the time could compete in terms of ruggedness, and the hardware and software would prove familiar to anyone who already had a Samsung Galaxy. The Xcover 2 was successful enough to spawn a couple more sequels. Never really cutting-edge, Samsung has been coming out with a new Xcover every couple of years leading to the current Xcover 4 announced in March 2017. Now sporting a 5" 720p display, a 13 megapixel primary camera, 4G support plus al the typical features of a contemporary lower-end smartphone while still retaining that FM radio that has always featured in these devices. Bigger and even heavier than its predecessors, the Xcover 4 is even more water resistant with an IP68 rating. Although certainly not unbreakable (big screens are always vulnerable to being dropped on pointy things) it would certainly last a lot long that an iPhone X in any demanding environment. So feel free to raise a glass to ten years of rugged Samsungs. And if you own one, it won't matter if you spill some drink on your phone either.